Zarma is one of the important southern Songhai speech varieties ( Harrison et al., 1997). It is also referred to as Dyerma, Dyarma, Dyabarma, Zabarma, Adzerma, Djerma, and Zarbarma. Differences between dialects in Niger are relatively small and people with a different dialect as mother tongue will understand you as you speak Zarma. To give an example, in the Songhai-Kaado some words that in Zarma are pronounced with an f, are pronounced with an h, such as the Zarma word fu (house, home) is in Songhai-Kaado hu. In the dictionary different spelling and/or synonyms are given. Zarma is spoken in Zarmaganda (arrondissement of Quallam) and the Zarmatarey (arrondissement of Kollo) in Niger, see map below. Based on: Harrison et al., 1997, background map: Microsoft-Elsevier, 2001. 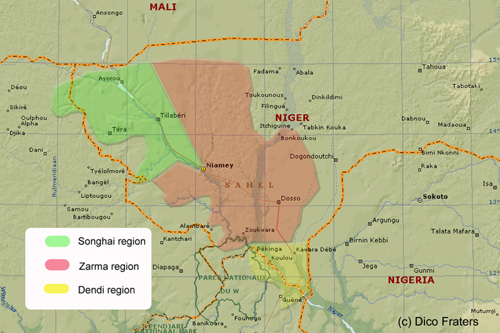 In total 2,438,400 people speak Zarma of which 2,350,000 live in Niger (estimation Ethnologue, 2006). However, this estimate includes other Southern Songhai dialects. Based on 1996 population figures Harrison et al. (1997) calculated that about 2,042,000 people spoke a Songhai dialect in Niger (about 23% of the total population) and about a 804,000 in the neighbouring countries. The number of speakers per dialect per country is given in the table below.